Creating a game on Gamestar Mechanic may seem intimidating at first. You may want to start with a simple top-down navigation game. The simplest type of top-down navigation game is to complete objectives while dodging enemies. The first quest missions contain a lot of top-down navigation games that you can try. If you’re a Premium user, you can go to the Naviron DX channel (on the left sidebar of Game Alley) for a wider selection. Space: Define the game space for each challenge. The dimensions of a room, for example, determine the function of the challenges within. You can design a space linearly, connecting a number of rooms in a chain, or find ways to mix and branch out challenges. Rules: A top-down navigation game often has simple rules: The player cannot be hit by enemies too many times, and must progress through the rooms as led by the designer. Though you may stick with this outline, you can use a number of other rules to give players a unique experience. For example, you might add a timer for an element of urgency or make enemies follow careful patterns that prevent the avatar from standing still, keeping it in constant danger to make for a more interesting challenge. Well-placed blasters or power-ups also add depth to the game, using a single space with different sets of rules. Goals: The primary goal of a top-down game is navigation — advancing past enemies to reach the goal block. The primary purpose of adding goals to this type of game is to provide extra elements to guide the player. For example, a series of points can guide the player through every corner of your design. Components: In a simple game, you need only an avatar, a block, a goal, and one or two types of enemies. However, remember that enemy paths, the routes that sprites take to challenge the avatar, count as components. Orchestrate patterns of enemies that cause interesting complications for the player, and apply the elements of space and rules to figure out how the other components fit together. After you gain experience, you can implement more detailed visual elements and enemy patterns. To design original components for a top-down game, try to keep track of which squares in your level can be accessed by at least one enemy. When an avatar is on one of these squares, the player must be alert, because an enemy will be coming to attack soon. Stationary shooters can threaten only straight lines; moving enemies can be adapted to threaten many tiles by running in intricate patterns. If you want to keep the player on guard, get some enemies to run through the unthreatened squares; don’t let the player rest during any challenge that values urgency. This method lets you see your components at a deeper level and gives you a rough idea of which parts aren’t quite challenging enough. However, you can always leave some squares unthreatened so that the player can catch a break. Mechanics: In a navigation game, the core mechanic is mostly laid out for you: Players must find their way through a series of dynamic levels, while avoiding damage and possibly a time limit. However, the game still has room for ingenuity: Innovative mechanics add flavor and depth to basic navigation games. 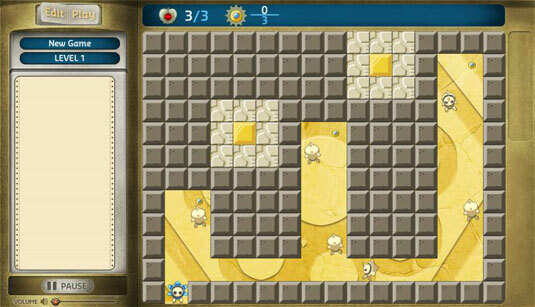 For example, players can enjoy solving puzzles and finding special power-ups to help them during the journey. You don’t have to add new mechanics and components to every game you make. Even if you can’t come up with an especially unique feature (though you may later), a well-formatted but classic game can still be outstanding.